Big Trouble re-teams Alan Arkin and Peter Falk in a pathetic attempt to duplicate the success of The In-Laws, the pair's unexpected 1979 comedy smash. Such follow-ups rarely work (remember Runaway Bride?) and Big Trouble is no exception. Even the film's writer, Andrew Bergman, disowned it, cowering behind a pseudonym instead of taking credit for this embarrassing stinker. It's just too bad director John Cassavetes couldn't (or didn't) do the same, and that Big Trouble turned out to be this fine craftsman's final film. Thankfully, Cassavetes possesses a solid body of work for which he can (and should) be remembered. 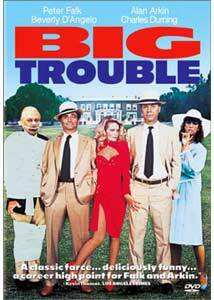 Big Trouble was a forgotten blip on his résum� until someone over at Columbia Pictures decided this unfunny screwball comedy deserved to be dredged up and carted out on DVD. That person's current employment status remains a mystery, but the decision, like many in Hollywood, was misguided. For if ever a film deserves to be locked away in an underground studio vault, it's Big Trouble. I never laughed, I never chuckled, I don't think I even smiled during this sloppy, disjointed farce. Arkin plays Leonard Hoffman, a frazzled insurance salesman panicking over how he'll finance his triplet sons' Yale education after their music scholarships fall through. When his stiff-as-a-board boss, Winslow (Robert Stack), refuses to chip in, Leonard mopes over to the home of prospective client Blanche Rickey (Beverly D'Angelo), a steamy and scantily dressed blonde whose husband Steve (Falk) is deathly ill�or so she says. Before anyone can shout Double Indemnity, Leonard sells Blanche a whopper of a death policy and they begin to plot Steve's demise. Leonard, however, is no Walter Neff. Instead of a tough lug, he's a wet noodle and lacks the stomach for murder and swindling, even if the proceeds will pay Yale's astronomical tuition. But as the plot thickens and Leonard digs himself deeper and deeper into bigger and bigger trouble, he begins to embrace the criminal world. Spoofing Double Indemnity is a nifty idea, but Bergman's script only takes the parody halfway, and litters it with such flat dialogue and overly broad slapstick that the gimmick wears thin pretty quick. Charles Durning tries his best to ham up the Edward G. Robinson role of the crusty, skeptical, cigar-chomping insurance investigator, but his role, like all the others, is never fully developed. Even Falk and Arkin flail about as if they're sinking in quicksand, frantically trying to wring laughs from their flimsy material. Rarely do actors look so lost and desperate. Cassavetes offers little help. A relative stranger to comedy, he seems uncomfortable with the genre, as if he's feeling his way as he goes along. Known to rely heavily on improvisation, Cassavetes may have encouraged his cast to veer away from the script. (And with a script like that, who wouldn't?) But if so, he needed to exercise more control, for Big Trouble often resembles a farcical free-for-all. Without a firm hand, the gags go on too long and lack the sharp focus that comedy craves. Viewers, however, crave laughs and the film supplies none. Big Trouble wastes all the talent involved, making old pros look like foolish amateurs. Who knew that Big Trouble's title could be so prophetic�not just for the actors, but for the audience as well. Image Transfer Review: The film may be a bust, but Big Trouble sure is nice to look at. Columbia's anamorphic widescreen transfer is, at times, picture perfect, with rich colors, accurate flesh tones and good clarity. The remarkably clean source print belies the film's age, although a slightly faded look does predominate throughout. Light grain is evident, too, but it nicely softens the film, adding warmth and a nostalgic glow. Shadow detail is weak, but I found no evidence of edge enhancement. Audio Transfer Review: The two-channel mono track is bright and detailed, with dialogue always comprehendible, even when spoken by the gravelly Falk. Bill Conti's bouncy, dated score comes through especially well, with added fidelity and solid presence. Big Trouble doesn't warrant big sound, but the disc's serviceable audio does the job. Extras Review: Three trailers comprise the skimpy extras package, two of which spotlight Neil Simon/Peter Falk collaborations. Sadly, these previews are more entertaining than Big Trouble itself. Big Trouble is, quite simply, a big mess. The fine cast seems to be having a fine old time, but they're the only ones. Despite a decent transfer, this film is trouble with a capital T and that rhymes with P and that stands for putrid.